Round out your job application with a professional cover letter. We have plenty of info about cover letters and how to write your own, but if you are specifically looking to work as a sales manager, you’ve come to the right place. 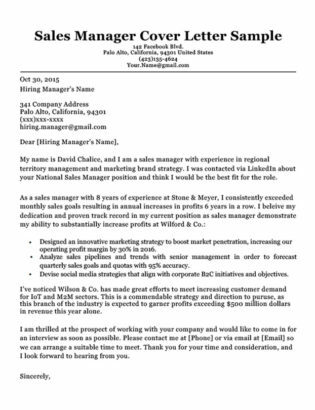 The below images show both the Sales Manager Cover Letter and the Sales Manager Resume. You can download your own for free by clicking the images below. My name is David Chalice, and I am a sales manager with experience in regional territory management and marketing brand strategy. I was contacted via LinkedIn about your National Sales Manager position and think I would be the best fit for the role. Designed an innovative marketing strategy to boost market penetration, increasing our operating profit margin by 30% in 2016. Analyzed sales pipelines and trends with senior management in order to forecast quarterly sales goals and quotas with 95% accuracy. Devised social media strategies that align with corporate B2C initiatives and objectives. I’ve noticed Wilson & Co. has made great efforts to meet increasing customer demand for IoT and M2M sectors. This is a commendable strategy, as this branch of the industry is expected to garner profits exceeding $500 million dollars in revenue this year alone. I am thrilled at the prospect of working with your company and would like to come in for an interview as soon as possible. Please contact me at [Phone] or via email at [Email] so we can arrange a suitable time to meet. Thank you for your time and consideration. I look forward to hearing from you. 1. Be specific: A strong cover letter will provide information about your past roles, what you did there, and how qualified you are as a candidate. It should also be assertive: let the employer know you want the position and believe you are the best fit. As a sales manager, you want to be explicit and convincing. 2. Emphasize skills: If you are already in a managerial role or are applying for one, you will want to prove that you can take charge. Provide examples that demonstrate your leadership qualities and effectiveness as a manager. If you are already in a managerial role or are applying for one, you will want to prove that you can take charge. Provide examples that demonstrate your leadership qualities and effectiveness as a manager. 3. Quantify: The best way to convince an employer of your ability is to give them quantified work experience. This kind of results-oriented language is vivid and helps employer’s gauge what kind of candidate you are. 4. Sell Yourself: The importance of selling yourself cannot be overstated. In a cover letter, it is acceptable to say that you’re the best candidate for the job. You want to come across as confident, knowledgeable, and dependable. 5. 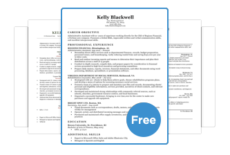 Borrow from your resume: It’s ok to restate key examples, words, and phrases from your resume. After all, that’s your best ammunition, so why not use it again? Choose aspects of your resume that pertain to the employer’s needs; this will make you stand out from the competition.